My playing has involved dressing this family for my granddaughter, Tessa. They were her mother's dollhouse family and had previously been much played with by her and her younger sister (Tessa's aunt) as well as by Tessa. Below is a photo of some of the family's original garments. As you can see, I dressed them in contemporary clothing ... the type worn by Tessa's family. The tops of my worn cotton socks made nice sweaters. 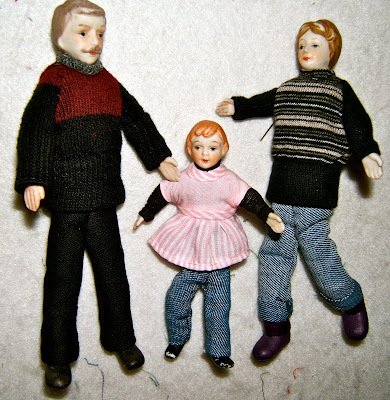 The daughter's top is a piece of left-over clothing from years ago when I had redressed another set of dolls that were this scale. Papa's pants are sewn from the excess twill that was cut off when I hemmed a pair of pants recently. The jeans are made from a lightweight denim in my stash. 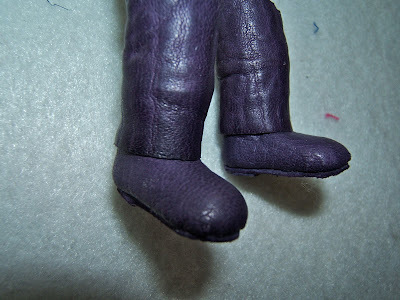 I was especially pleased with Mama's purple leather boots. They're crafted from a fine pair of leather gloves given to me for this kind of purpose by a friend. Not only had the clothing been worn out, but the material for their bodies had given way. I did some reconstruction work by wrapping strips of fabric around the original padding. There's lots of stitches tacking it together. The girl's legs are wrapped with yellow fabric because I thought a bit of her leg may be exposed when I dressed her and it would appear she's wearing yellow socks. This family is packaged up and in the mail ... headed for a lot of playtime by Tessa and her friends. Oh wow, you are so very clever at adapting items around the house. What a treasured doll set this must be. Totally precious! I love that kind of doll. I have to say, I just love the purple boots!! What a well dressed doll family Nellie and congratulations on keeping them going from one generation to another, rather than throw them away and buy new. These are so much nicer. Love the purple boots. Your grand-daughter will be thrilled, I'm sure. 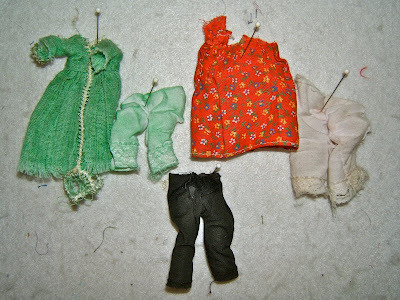 Doll clothes have come a long way! 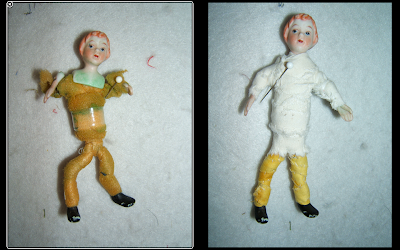 Looks like you had a lot of fun dressing these dolls. What clever ideas! Your granddaughter will love them! Wow Nellie! I really didn't recognize them until I read the description. They look nice and much more modern. Like a little GAP family.